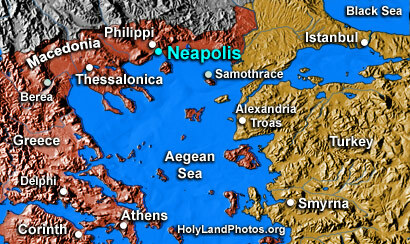 Neapolis is the Aegean seaport of Philippi where Paul landed on European soil on his second journey (Acts 16:11). He arrived here after sailing for two days from Alexandria Troas in Asia (Acts 16:11). Today Neapolis is called Kavala (from Latin for "horse" due to its horse trading history), a Greek city of about 60,000 people. The modern city is built over the ancient one.